Do you even remember typewriters? They are museum pieces today! Yet, what an advance they were when they first became available as manual machines, later graduating to the electronic versions. According to https://www.britannica.com/technology/typewriter the first typewriters were marketed in 1874, and soon became known as the Remington. Originally designed to prevent the jamming of typewriter keys, the QWERTY keyboard is still used on our computers and mobile devices. My father purchased a small portable typewriter when he began writing notes for his book Golden Memories of Barberton. He used the two-finger ‘hunt and peck’ method and, over time, became quite adept at typing so accurately that he was able to place carbon paper between two sheets of paper in order to have a copy of his notes and writings. He once made an error while writing the above mentioned book. As it was near the end of the page, he simply changed the name of the person (thus creating a fictional character whose story is dying to be written) and included it among the real characters. No-one has ever questioned the existence of this chap! My own relationship with a typewriter began many years ago, when I realised how the skill of typing could help me in the preparation of my teaching notes (we used Gestetner roneo machines then!) and I enrolled for a typing course at our local technical college – starting at what would now be called a Grade 10 level. I plonked away at the large machine against the back drop of either music or the teacher clapping a rhythm with her hands. Clack, clack, clack went the keys as my fingertips bore the bruising from whacking the sticking keys with gusto. There were speed tests and times when we had to look up while typing to increase the accuracy of our work. These were manual machines which required one to flick out one’s left hand to deftly move the paper to the next row without losing either the rhythm or one’s place in the text: ting, ting, ting … one could tell that everyone present had a different speed of typing. Clack, clack, clack, ting, ting, ting … it was sometimes difficult to keep pace with the music or the clapping, until I learned to screen it all out and focus on my own sounds – a useful skill. I inadvertently entered for the matric (Grade 12) level examination at the end of the year and was greeted with a variety of challenges I had not prepared for. To my delight I passed well and have never regretted the evenings spent on that course. It proved to be an extremely useful skill when my husband was preparing his manuscript for the first edition of his Field Guide to the Natal Drakensberg. Not owning a typewriter yet, we borrowed his sister’s electric one. What a joy that was to use – especially as I frequently had to rock our first child to sleep in his pram with one foot whilst typing! I used a different electric typewriter when typing his Master’s thesis and appreciated the smooth rhythm and fairly quiet keyboard so much that, once we could afford it, I purchased an Olivetti golf ball typewriter – how useful it was to be able to change balls to alter the fonts! I loved that typewriter so much that I kept it for years after we had moved to a computer. With my husband’s PhD in the offing though, I simply had to get to grips with our new computer. I learned about spacing and tabulating and all sorts of finer aspects of producing a thesis on a ‘need-to-know’ basis and by trial and a lot of error! I have never looked back … my beloved electric typewriter was eventually taken to the Hospice Shop complete with a set of golf balls and boxes of ribbon. I hope it found a happy home and proved to be useful for a while longer. I often reuse paper that has been printed or written on one side only. The other side of a page I used today contains a rough outline for a lesson I once was preparing about a novel that had been prescribed for examination purposes. Explore the notions of TRUTH, MEMORY and IDENTITY I had written some years ago. The actual lesson has become lost in time, yet I still ask myself, what is our relationship between memory and truth? What do we truly recall from our childhood: what really happened; or are our memories infused with the oft retold family anecdotes; or jogged by the familiarity of photographs that have been poured over so many times? Do we ‘shape’ our pliant memories by ‘forgetting’ awkward acts or once expressed opinions once they become problematic in our present circumstances? Then there is the written word. Along with the commemoration of the centenary of the First World War has come a plethora of publications, many of them based on previously forgotten diaries, letters and post cards: those words falling like dew upon a thought that have been reconsidered and brought to light, ‘re-packaged’ if you like, are making thousands, perhaps millions, think – albeit with the advantage of 20/20 hindsight – about the causes and long-term ramifications of a war that has, until now, mostly been dissected and discussed based on ‘official’ records. It has taken a century for us to begin to appreciate what ordinary soldiers, sailors, nurses, airmen, housewives, mothers, lovers, and even teachers, thought about the turbulent times they were living through. I still have letters from friends detailing the process of settling into new countries; the heimwee they still feel for this one; accounts of the amazing holidays their new locations and stronger currencies have afforded them; along with the continual interest they show in the country of their birth whilst embracing what their new one has to offer. What will happen to your letters, diaries, e-mails or blogs one day? Like those ordinary writers of old, you probably do not write a single word with the intention of it informing the generations to come about what it has been like to have Donald Trump in charge of the United States, or to weather the storm in the wake of Jacob Zuma’s decisions that have sent South Africa hurtling towards Junk Status. All words. All small drops of ink. All memories that combine to form a picture of the topsy-turvy times we are living in. Our words help to express our identity, our truth, and our memory and might, collectively, make thousands, perhaps millions more in the future think. In his autobiography, The Outsider: my life in intrigue, Frederick Forsyth explains that within the mind of a writer entire worlds are created or erased … People come into being, work, love, fight, die and are replaced. Plots are devised, developed, amended and come to fruition or are frustrated … In children, daydreaming is rebuked; in a writer it is indispensable. Few of us think our lives are particularly interesting or remarkable enough to record. If we did, publishers would be inundated by autobiographies. Yet, eavesdrop at dinners or the meeting of strangers on holiday and you will become attuned to the stories plucked from the lives of ordinary people to inform, build bridges, or merely to entertain. We all have a story to tell. Some of these anecdotes have been told so often that partners often finish them for each other, or egg each other on towards the highlight. The familiarity of these stories fixes them, making them difficult to change. They nonetheless get retold to show an alternate side of ourselves to people who have come to know us in a different context; to confirm our allegiances to others; or to illustrate the connection between the present and the past. An element of trust is at play when we share our personal stories. This was particularly evident when I attended a series of workshops a few years ago. The participants were issued with pens and paper and, as we sat in a circle, we were asked to write down various aspects of our lives on cue – describe one of your most frightening moments; an occasion that made you face your innermost fears; a choice you made that was out of character for you. Of course these did not happen all at once, but as we diligently set about writing in response to the first instruction, none of us realised we would be required to share them. Sometimes we read them ourselves. At other times a randomly chosen partner read them on our behalf; yet on other occasions we were asked to talk about the particular experience during a shared ‘chat session’ with yet another randomly selected partner. As uncomfortable as this was initially, the experience proved to be both interesting and enlightening. We ended up being surprised at the hitherto unknown inner strengths, fears and accomplishments of colleagues who gave no hint of such things on the surface. We unwittingly learned about empathy, respect and to realise that so much more lies behind the faces we work with every day. I recently threw out my notes from those sessions. Before doing so, however, I reread what I had written and surprised myself by what had been laid bare – I would never have imagined that anything in my life was ‘write worthy’, yet some aspects of it had been gently coaxed out of me. No matter the occasion, when people are together for any length of time, an exchange of stories will begin. This might be in the form of a tentative exploration of where we come from; a delicate process of sussing out what we have in common; an exchange of opinions; or even a confession of sorts about health, personal circumstances, concerns or joys. Stories are part of the way we understand our history and shared anecdotes go a long way towards understanding the lives of the people within our social and working orbit. In this sense, the stories we tell about ourselves can be powerful – as are those stories we tell ourselves while seeking an understanding of where we are, why we are, and what we are becoming. Wallace Stegner’s Crossing to Safety is a marvellous depiction of the friendship between two couples through their waxing and waning fortunes, as well as their trials and tribulations spanning forty years or so. Their back stories and shared experiences form the weft of their relationship, weaving their lives together with increasing strength and flexibility. I have just finished editing the first draft of my late father’s memoirs. On the surface he was as ordinary a person as any of us are: a miner, a farmer, an amateur historian, a husband, a father and grandfather. If only I had known about this endeavour before he died, I would have been able to explore so much more! What a story he has to tell of life as we will never know it again; of courage and perseverance; of love and adventure. It proves the point that the unfolding of our lives are stories with no end. As ordinary as they may be, they help others to make sense of our lives and they deserve to be shared – at least with the next generation. I recently wrote about the waning art of letter writing and return to it again for this is a subject that resonates with me: I enjoy writing letters. Real letters. Letters that give the recipient a flavour of what we have been doing, what is happening in this country, and that share opinions about cultural and social issues. My favourite form of letter-writing is by hand. I usually sit at the small stinkwood desk that used to belong to my grandmother and later my mother. Holding a pen in my hand seems to provide a connection of some sort to the person I am addressing. More importantly, sitting at my desk focuses my attention on the act of writing. True, I look up now and then to watch birds as the pass the window or call from the tree tops; to observe the effect of the changing light on the landscape; or simply to gaze into the distance while my thoughts flow. 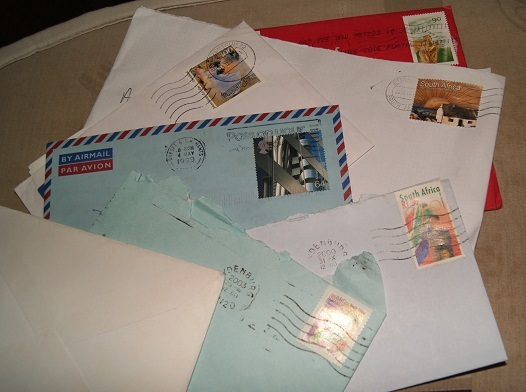 Letter-writing is a pleasurable activity for me. I have three, maybe four, faraway friends who also still use what has disparagingly come to be known as snail mail. One only writes by hand and another often adds a page or two of handwritten comments at the end of a typed letter – often a ‘one-size-fits-all’. I used to assume that most people resort to e-mail. I certainly type a lot of letters these days and attach them to e-mails – more often because I am unable to get postage stamps. Even these ones though are composed with care, the recipient always in my mind as though we are having a conversation. They are satisfying to compose and I look forward to receiving some interesting replies. Articles and blogs I have read during recent weeks decrying the waning art of letter-writing and ‘old-fashioned’ face-to-face communication have confirmed that ‘most people’ do not resort to e-mail after all. Like SMSes/text messaging, e-mails have become passé, used for internal business communications and as a vehicle for would-be scammers. We were discussing the role of Facebook the other evening. One brave soul commented that she had withdrawn from Facebook and faced a barrage of reasons from the others present why Facebook is such an important vehicle for communication these days. I remained silent for I have never joined that community. One person said “I rely on Facebook to remind me of birthdays” while another wondered aloud whether wishing all one’s ‘friends’ a happy birthday through that medium was as meaningful as sending a message via Whatsapp – or even e-mail – might be. Articles about the benefits of taking a break from Facebook, switching off Twitter, and promoting family time without the ubiquitous cell phones abound. A recent article pointed out that modern society has become so dependent on social media that people feel they are losing out if they are not constantly ‘plugged in’. This reminded me of articles discussing the etiquette of watching television that were published once South Africans were at last able to have that broadcasting medium in their homes!